Knorr-Bremse drum brakes and slack adjusters are used in various applications on axles of commercial vehicles providing the service and parking brake function. Knorr-Bremse develops, manufactures and markets S-Cam drum brakes and slack adjusters. Together with pneumatic brake actuators and brake drums they represent a foundation brake system. 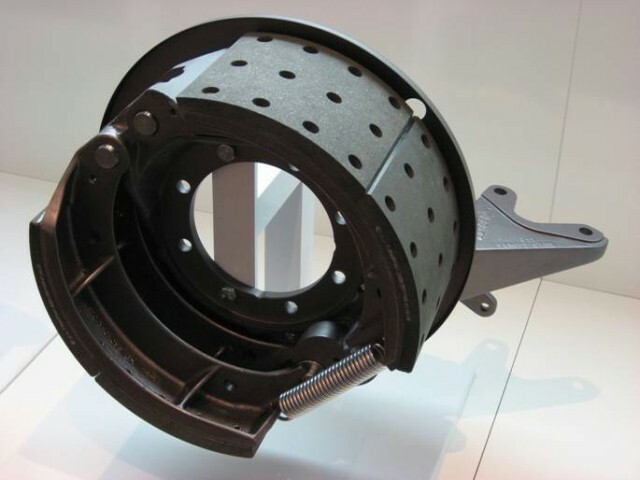 With all types of drum brakes, friction forces are generated by internal brake shoes being pressed against the inner surfaces of the brake drum by the force generated by a cam. Due to their almost completely sealed housing, the brake shoes are well protected against corrosive influences (water, salt, dust) and dirt (sand, stones and mud), even when driving on rough terrain. With the s-cam brake, the cam and camshaft are rotated as a result of the force of the brake actuator acting on the slack adjuster. The brake shoes with brake linings are thereby pressed against the brake drums. Automatic Slack Adjusters compensate for the wear of brake linings and drum and ensure a constant running clearance between these parts.